Meredy is a member of Grimoire Heart and one of the members of the Seven Kin of the Purgatory. She first joins it after Ultear, Zancrow and Kain find her in a destroyed city crying. Ultear takes her in because she senses that she has great magical potential and thinks she resembles herself. From that day she has considered Ultear her mother. Meredy seems to have two distinct personalities. 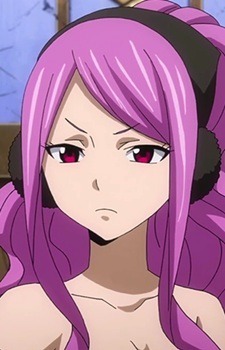 The first one, is her stoic, mature, calm, emotionless and seemingly lifeless manner. The other is her childish side which she displays once she arrives on Tenrou Island. Later, she develops a stronger sense of friendship when Juvia teaches her the lesson that; she must live for the people she cares for. Currently, she's a member of Crime Sorcière, an Independent Guild.